Two Idioms, A Tale of Two Cities. “Get out of Dodge” (or its more empathetic but still family-friendly formulation, “Get the heck out of Dodge”) as well as “Shuffle off to Buffalo” are two idioms that express roughly the same sentiment. Which is to say both indicate the need to depart from a location or situation. But how these two idioms differ in shading or emphasis is what the fun is all about when it comes to understanding and using figures of speech. 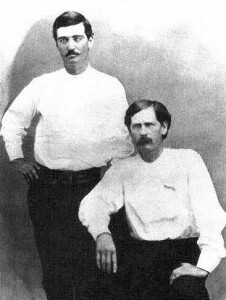 Wyatt Earp and Bat Masterson. Few know that Wyatt’s friend, gunfighter/lawman Masterson, later went East and became a celebrated reporter and columnist for the New York Morning Telegraph, a sports newspaper. He died at his desk of a heart attack in 1921. “Get out of Dodge,” to put it simply, means to scram. It’s used to indicate the desire to leave something or somewhere immediately, in order to escape something bad that has happened or will happen. A faint whiff of scruffy danger clings to this idiom, and that’s why you wouldn’t use it when loading up the family SUV and embarking on a pleasant vacation. However it would be more than okay to utter the expression when ending a bad relationship or upon exiting a crummy job. That air of desperado swagger-ness that is part of “get out of Dodge” is due to the expression’s association with Dodge City, Kansas. Back in the early 1880s, Dodge was a rip-roaring frontier cattle town, complete with its premiere drinking establishment, The Long Branch Saloon, it’s own cemetery, Boot Hill, it’s own fancy dance hall den, The China Doll, and its own law enforcement officers, including Wyatt Earp and Batt Masterson, later of Tombstone, Arizona fame/notoriety. And if these names and places sound familiar, it’s because for more than 140 years, Dodge has been the setting for countless western tales told in books and movies. But it was a TV show that truly cemented Dodge City in America’s national consciousness as the place to hotfoot out of. Gunsmoke, a highly popular television program that ran from 1955 to 1975, was one of the final survivors among the dozens of TV cowboy series – sometimes referred to as “oaters” – that used to fill up the schedules of all the major networks. Each week, Gunsmoke featured the life and times of Matt Dillon, a fictional marshal who maintained law and order in the not-so-good city of Dodge. 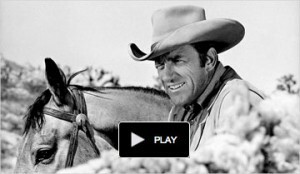 James Arness, as Marshal Matt Dillon of Dodge City. Click to see the marshal face down a gunslinger on a street in Dodge. As played by the towering actor James Arness, Dillon was a solidly honest man of few words who struck fear in the hearts of wrongdoers. Merely encountering the stern visage of the marshal would be enough, it would seem, for the more prudent among the myriad of gunslingers, bushwhackers, cattle rustlers, hornswogglers and other assorted scallywags to self-deport themselves from Dodge, and fast. And that seems to be how the phrase “get out of Dodge” originated. While there appears to be no evidence that James Arness ever spoke these words or anything similar to them, it is the consensus on the web, of those interested in the history of idioms, that the expression first originated in the 1960s or 1970s among the many fans of Gunsmoke. “Shuffling off to Buffalo” is a playful, gentle way to indicate it’s time to depart. It is almost always used in cheerful or relaxed situations, like at the start of a journey or when you’d like to leave a party or exit from a restaurant. As for the idiom’s origin, there is no mystery. “Shuffle Off to Buffalo” is a tune from 42nd Street (1933), a backstage movie musical that became a tremendous hit. Ruby Keeler and Clarence Nordstrom in the “Shuffle Off to Buffalo” number in 42nd St., the movie musical. Click to see a clip from the all singing, all dancing, all talking, motion picture. And you can see why. This moving picture has got it all – a down-on-his-luck impresario betting everything to achieve a comeback; a leading lady whose “sugar daddy” is bankrolling the production, a young Ginger Rogers as a chorine with the nickname “Anytime Annie,” and an ingénue from the sticks, played by Ruby Keeler, who is thrust into a starring role due to a cast member’s accident. I know, it sounds corny, but the film is as well crafted and tautly strung as a Stradivarius. The camerawork snaps and pops; the plot, convincing; and the dialog is knowing and direct. But it is Busby Berkeley’s choreography that steals the show. Known for his production numbers that featured fantastical sets, props, and costumes, Berkeley moved his armies of dancers with magical precision to produce spectacular kaleidoscopic effects. Actually, the production number for “Shuffling Off to Buffalo” is almost intimate in scale by Busby Berkeley standards – the routine only features the cutaways of two larger-than-life Pullman sleeping cars and a host of passengers simultaneously preparing for bed and teasing a young newlywed couple on their honeymoon journey to Buffalo and then Niagara Falls. Besides hearing a catchy tune and seeing great staging, you learn a lot about 1930s newlyweds and train travel when you watch this scene from 42nd Street. You wouldn’t dare use this expression with someone who was actually grieving the death in question, or in any serious circumstance. What I think people are trying to do when they use this idiom is to take some of the sting and finality out of the event. I don’t believe they mean any disrespect. I also think they might be trying to communicate to listeners the commonness and casualness of death itself. It is something people do, and it might not necessarily be terrifying. And since the expression is never really used in a mean spirited way, maybe the user might think the deceased would have liked to be referred to in that manner, with gentle humor. But why would such a light-hearted ditty – all about happy trips and romance and eventually having children – become a verbal stand-in for death and dying? 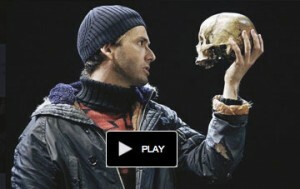 David Tennant in the Royal Shakespeare Company’s stage production of Hamlet. Click to see his highly moving performance of the play’s “To Be or Not to Be” soliloquy. “Coil” was a synonym for “turmoil” back when Hamlet was written, and only later did the word obtain the meaning it has today – something spring-like in shape, in the form of circles on top of circles. This newer meaning still works in the “mortal coil’ phrase – when I originally heard it, I imagined a spiral stretched through time, with human lives perched precariously on it. “Shuffled off this mortal coil” became a classy and dramatic way to say someone died. And then, about 430 years later, great masses of Americans heard the opening bars to “Shuffle Off to Buffalo” and thought the song’s title would make a funny substitute for the Bard’s very serious words. 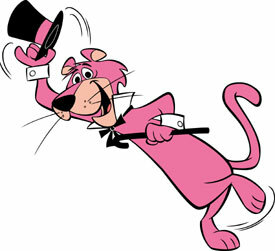 TV cartoon character “Snagglepuss” first appeared in 1959. This entry was posted on Tuesday, September 17th, 2013 at 3:11 pmand is filed under . You can follow any responses to this entry through the RSS 2.0 feed. You can leave a response, or trackback from your own site. Thank you for the education and humor! I found this post when looking for an explanation of the phrase “I am gonna shuffle off to Buffalo!”, because I heard someone say it at a party yesterday, and I asked the woman if she was flying to Buffalo for the holidays. She laughed, but could not remember the origin of the phrase, so I googled it. Thank you again! I recall seeing a film where the last couple of bars of “Shuffle” were used in vaudeville as a cue to hurry an over-long act off the stage. Warner Brothers also used the same concept to exit their cartoon characters with the signature music of the song, with the “Sure, we’re gonna shuffle” line as shorthand for a quick exit, expressed as “Yatta-yatta-yatta”, in imitation of the horn section. Seinfeld? There was a funny moment in “Loverne & Shirley” show where Rose another lady while leaving their house said “I will be shuffling off to buffalo”. I could feel it being an expression but couldn’t put it in context. after visiting your page, I can laugh as to why Rose said that. Anyway, a big thanks for writing about these 2 idioms with history. Great work. these days its not easy to get such educational explanation. Thanks for the copy editing help. Regarding James Arness, I’d love to know the source. Here’s a clip from Gunsmoke where he says “Get out of Dodge” https://www.youtube.com/watch?v=Qfy0cCTqAdY. Came up in the same Google search as this post. But otherwise, thanks for taking the time. I have to say when I looked up the etymology of the phrase I was quite disappointed to realize it came from a TV show. I’d hoped it was at least a genuine “Old West” expression. Alas. Interesting theory re: “shuffling to Buffalo” linked to “shuffling off this mortal coil.” I’m not convinced 100%, but it’s certainly possible. I also hadn’t heard that “coil” was once a synonym for “turmoil” – that piece of info alone was worth reading the entire post, for me :). Coil = Turmoil. I guess if you imagine a stretched wire coil, it becomes a spiral, and then it can become a visual metaphor for a state of dizzying confusion, i.e. turmoil. Thanks! Really enjoy reading these snippets. My parents (now sadly deceased) were of the Depression era and close friends (happily still gracing this earth) hail from a generation just a decade after my folks. I am 40 to 30 years their junior. Both sets of cohorts use(d) phrases that have become a part of my psyche, but from which I had no point of reference. Your blog has been very helpful! Now, I can join in the conversation and have some point of reference to the banter! Link to the TCM movie clip appears to be broken. Thanks for the great site. Found it this afternoon looking for “Cut of his jib” and have been on your site ever since! Thanks for the great compliment. I found another video clip for the song “Shuffle Off to Buffalo.” Enjoy! Your comments about Bat Masterson (who went east,) remind me that Wyatt Earp went west; and after multiple adventures, he ended up in Los Angeles at the end of his life. He realized that the only thing he had of value was first-hand knowledge of the “Wild West,” so he did consultation for movies. A young John Wayne met Wyatt Earp several times on movie sets and patterned the walk, talk and persona of his cowboy character after Wyatt Earp. Along time ago, right after I graduated from college, I saw a light comedy/western called “Hearts of the West,” which starred Andy Griffith in what I now realize thanks to your comment, was a thinly disguised portrayal of Wyatt Earp in decline. In this genial, touching, and actually quite well-made “oater,” Griffith’s character tutors a young Jeff Bridges on how to act like a real rootin’, tootin’ lawman yore. Try to view it, I think you’ll like it.